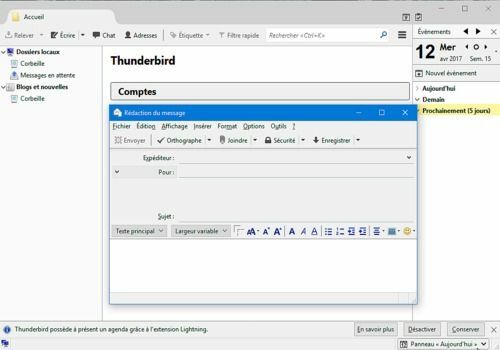 Mozilla offers a free advanced and efficient Mail client: Thunderbird. This program has a simple but very functional interface that can be adapted to your needs. You can add several accounts and switch between them very easily. Thunderbird supports POP3 or IMAP accounts and uses a tabbed system to navigate between inboxes and emails. Working in conjunction with Mozilla Firefox, Thunderbird quickly gains the same improvements as the browser. This provides you with a fully customizable toolbar. Many extensions are also available as well as themes to customize the look of your email client. Lhe latest versions of the software have provided compatibility with social networks such as Facebook and Twitter to allow users to chat with their contacts from the Thunderbird interface. A powerful solution in the world of messaging clients. It offers many unique features that really set it apart from other email clients. A freeware utility. It allows you to export emails from Mac Mail mailbox files (Mac OS email client) to multiple EML file formats.